Dr Ronx is an Emergency medicine doctor by profession. She describes herself as a queer, black, androgynous intersectional feminist. She self-funded her way through Medical School after leaving home in her teenage years. During this time she worked part time in retail, fashion modelled, and danced in music videos to sustain her progression through medical school. She graduated from Kings College Medical School in 2011. Her desire to train as an A&E doctor began after foundation training and she took a year out before speciality training to work as an Expedition Field Medic in India. On returning to the UK, she began her A&E career and didn’t look back. Dr Ronx comes from a difficult upbringing and as she progressed through training she realised that her unique story could help motivate and inspire young people from similar backgrounds. She has an infectious personality. She is funny, enthusiastic, encouraging but also assertive, empathetic and very approachable. Juxtaposed with her aesthetic, she captures the attention of young minds. Dr Ronx lives and works in Hackney and is extremely community-focused. She volunteers her time to give inspirational talks using her life experience to encourage and inspire young people to think about their desired future careers positively. Her motto is “ You cannot be, what you do not see”. Dr Ronx believes this so much that she has even crossed the river to give talks in schools in South London. In addition to the inspirational talks, Dr Ronx carries out one-to-one and small group sessions with young people with a desire to attend Medical School. She has given interview technique mentoring and signposted young people to work experience opportunities. 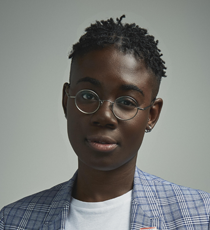 Young people are captivated by her, and she has been asked back by popular demand to give a talk at the annual “Hackney Inspiring Young Women’s Event”, organised by Young Hackney. It was at this event, 2 years ago that Dr Ronx was spotted by a TV commissioner and this year is set to be filming her first children’s TV presenting job, due to be aired in Autumn 2018. This role is exactly how Dr Ronx aims to self promote her motto; she wants young people to see her on screen and not only learn aspects of medicine, the human body and biology, but see her and believe that they too can aspire to reach their dreams. Dr Ronx also is involved in charity work. In 2017 she raised over £1000 for a refugee camp where undocumented Syrian refugees had settled in Turkey. She also volunteered there, distributing food and spreading public health messages. In 2018, Dr Ronx raised nearly £2000 to send over 400 East end young people and their caregivers to see the film “Black Panther” at Genesis Cinema, in Mile End. Genesis were so impressed by her efforts that they offered 2 for 1 on every ticket. After seeing Black Panther, Dr Ronx and her friend Luke were blown away by the majority black cast and positive role modelling. This inspired them to use social media to raise money to ensure that as many young people as possible would also be able to see the film. In addition Dr Ronx sits on a panel of Hackney Judges who meet yearly to award three nominated members of the Hackney community with the “Mayors Hackney Community Award”. This year she has been nominated herself for the, “Celebrating Hackney Women Award 2018”. This year she is very excited to have been invited to travel on the Hackney float for the London Pride parade. In her spare time Dr Ronx is an keen runner and cyclist. She runs the Hackney Half marathon every year, has cycled from London to Paris and completed the coast to coast, all on her Brompton bike! Dr Ronx has a penchant for suits and Nike Air Max 95s which she feels that being her true quirky self makes her approachable to all. Dr Ronx is passionate about everything that she does, her unique aesthetic , medical knowledge, engaging manner and desire to amplify the voices of young people, makes her one of Independent’s exciting new talents of 2018.